Mountain life can be both luxurious and comfortable in this beautiful 2-bedroom, Breckenridge condo located at 156 Lance Lane in Breckenridge, CO. It’s so spacious that there’s even a loft! Whether you use it for an extra bedroom or for storage, you’ll have plenty of space for family and guests. 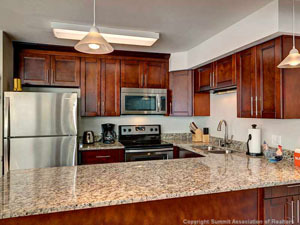 As you can see in the photos the entire condominium has been upgraded. That means you’ll enjoy a new kitchen, remodeled bathrooms, updated windows and doors, new carpet and new tile. On top of these stylish renovations, the condo’s exterior was recently repainted in 2012. One feature which sets this complex apart from others currently on the Breckenridge real estate market is that it is uniquely private. There are just 8 units which are divided into 2 separate buildings. Basically, you can enjoy a close community environment without being surrounded by condominiums on all sides. While you are part of a community, you have the added calm and privacy of having only a few neighbors. The view from this Breckenridge condo is spectacular, too. Your home overlooks beaver ponds and lovely mountain scenes. Don’t forget that you’re just steps away from one of the most popular Main Streets in Summit County as well. From quaint shops to exquisite restaurants, Breckenridge’s downtown has it all! Put it all together and you will have a wonderful home in this gorgeous Breckenridge condo. It’s perfect as a year-round home or a vacation getaway. For a beautiful home in a terrific town, put this condo on your list of properties to see! If you’d like to visit this Breckenridge condo in person, let me know and I’ll arrange a tour that’s convenient for you. Also, if you’re interested in Breckenridge real estate but haven’t put together your list of properties to tour, feel free to browse through the updated listings on my website any time. Then we can talk about the homes that interest you together.